In Canada, as in most "first world" economies, the general population is getting older. The one anomaly is on native reserves, where on average more than half the population is under 25. What this means is that First Nations are undergoing a spirited revival after a century of repression, depression and marginalization. North of caution, Cape Caution that is, there lies a beguiling region where the promise of a conservation economy is within reach. Different people call it different things. Canada's Forgotten Coast. The Great Bear Rain Forest. The Central Coast. The Inside Passage. Land of the Spirit Bear. The Mid-Coast. British Columbia's Hidden Heart. The Northwest Coast. Home. 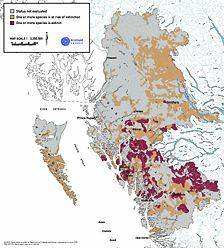 There are something like eight million acres of coastal temperate rainforests in this region. These forests exist where the land meets the sea, and are among the most complex and diverse ecosystems on Earth. In prime sites, the biomass in these temperate rain forests is four times as great as any comparable area in the tropics. That these forests are increasingly rare and threatened is hardly news. That eight million acres outside of parks saw out the 20th century largely intact is so remarkable as to be almost unbelievable. North of Caution, it is still possible to find whole watersheds — tens of thousands of acres at a time - that are unlogged and largely unaltered by man. Millions of acres in all, home to grizzly, black and Kermode (white) bears, home to the salmon that feed the bears and provide nutrients to the streams and the soil, home to wolves and eagles and, of course, to huge hemlock and spruce and cedar trees. Various campaigns are afoot to "save" these forests. People are being urged to "discover" these supposedly "forgotten" lands. But what is most easily forgotten — what was forgotten for most of the 20th century by governments and industry and, yes, even environmentalists — is that this coast isn't forgotten at all. It may be home to all manner of diverse creatures and complex biological relationships, but it is also home to diverse cultures and complex societies of people. Canada's Forgotten Coast has in fact been home, for around 10,000 years, to the Heiltsuk and the Tsimshian and the Haisia and the Kitasoo-Xaixais and the Owekeeno and the Kwakiuti and the Nuxalk, to name a few. These are who Canadians refer to as their First Nations, though for 100 years and more they have been last in line for the social and economic benefits that have flowed from B.C. 's abundant resources. Wilderness campaigns that don't accommodate people will fail. The challenge on Canada's Forgotten Coast is not to stop logging or fishing, but to start an economy that grows within the ecological limits of the region's resources, and builds social equity, especially for historically deprived native people. At Ecotrust Canada, we call that a conservation economy. 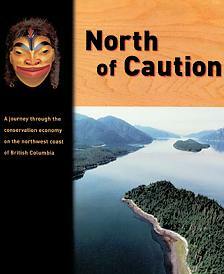 Our book, North of Caution, is offered here not as a prescription, but as a navigational device to enable us all to steer towards a conservation economy. In preparing this book, we have learned much more than we could ever presume to teach. So we present what we have learned along the way in order that others might share our journey, and come to appreciate the enormous opportunities that await people North of Caution. For us, the Great People Rain Forest includes bears, and salmon, and trees, but it succeeds only if we preserve not just trees, but options for people to live lives of dignity and prosperity, where culture flourishes and new myths and a new economy emerge from the mists of possibly the most spectacular wild place left on Earth.